Japan PV Association outlines plan to reach 100GW installed solar by 2030; India looks to boost PV capacity by trebling amount utilities must buy. Solar ambition continues to mount in Asia, with predictions this week that Japan could reach 100GW of installed PV by 2030, and the suggestion of reforms in India that would boost the amount of solar that utilities are required to buy. In Japan, the country’s Photovoltaic Energy Association issued a strategy document outlining how Japan solar could reach 100GW of installed PV generation capacity by 2030. “By 2020, Japan could target 65.7GW of solar capacity, raising the bar from predictions made in 2013 for 49.4GW by that date,” a JPEA statement said. JPEA also recommends doubling the value of the domestic solar industry from its current 1 per cent of GDP by 2030. As CleanTechnica reports, solar is about to become profitable in Japan, with residential solar now costing less than half of 2010 prices and comparing favourably to average household electricity prices. 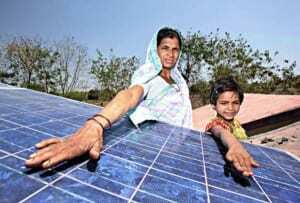 In India, meanwhile, the federal ministry of power has proposed raising its Renewable Purchase Obligation (RPO) mechanism from he original target of 3 per cent by 2022, to 8 per cent, effectively trebling the amount of power generation utilities must source from solar generation, and bringing the date forward to March 2019. As PV Tech reports, to comply with RPOs, electricity distributors or ‘discoms’ can either generate a minimum amount of renewable power or purchase renewable energy certificates (RECs) to make up for shortfalls. According to consultancy firm Bridge To India, the new RPO target implies an aggregate solar capacity of 69GW by 2019, which is equal to 87 per cent growth per annum. Although this is compliant with the 100GW generation target by 2022, Bridge To India described it as “nonetheless extremely ambitious”. What’s wrong with these people? Don’t they know Australia is gearing up to sell them lots of expensive dirty coal. Don’t they know that the world needs coal to generate electricity, and will continue to do so for the next 50 years? Honest Tony told me! Abbot, Macfarlane and Hunt are busy doing their highly acclaimed three wise monkeys act, while the rest of the world just gets on with it.